The Telefónica District offices in Madrid have once again been the place chosen for the official presentation of the new Movistar Team project, a group that a few days ago received the news of the renewal of its sponsorship until the end of 2021. Of course, Alejandro Valverde has not failed to this act, the cyclist who will wear the rainbow jersey during the 2019 campaign. Valverde has been one of the great attractions of a launchment directed by the journalist Mónica Marchante and Pedro Delgado. 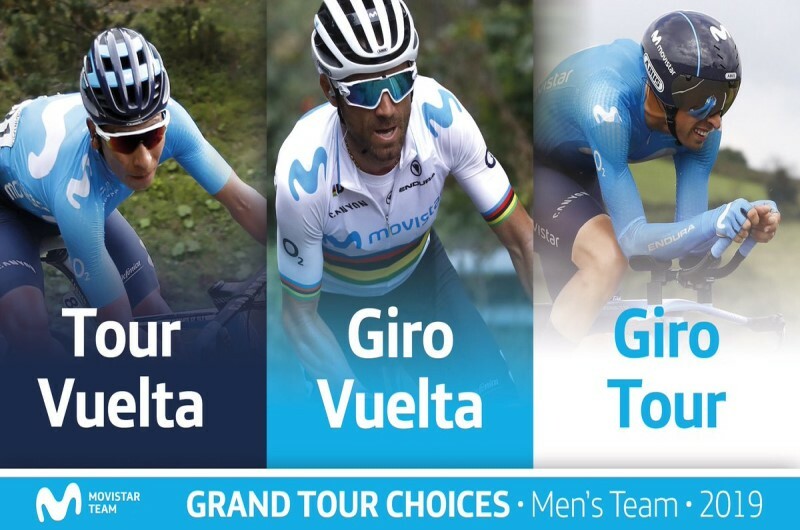 They have announced the names and goals of the main athletes in both the male and female teams of the 2019 adventure of Movistar Team, the ninth of the telephone company in charge of the World Tour squad. This way, it has been revealed that the Giro d’Italia and the Tour of Spain will be the two Grand Tours in the Valverde’s schedule this coming year. The Murcian rider returns to the pink race, where he debuted with a podium and stage triumph in 2016. If the season continues its intended course, Bala will start in Alicante his 13th Tour of Spain. Male: Andrei Amador, Winner Anacona, Jorge Arcas, Carlos Barbero, Daniele Bennati, Carlos Betancur, Richard Carapaz, Héctor Carretero, Jaime Castrillo, Imanol Erviti, Rubén Fernández, Mikel Landa, Lluís Mas (N), Nelson Oliveira, Antonio Pedrero, Eduard Prades (N), Nairo Quintana, Jurgen Roelandts (N), José Joaquín Rojas, Eduardo Sepúlveda, Marc Soler, Jasha Sutterlin, Rafael Valls, Alejandro Valverde y Carlos Verona (N). Female: Aude Biannic, Roxanne Fournier (N), Mavi García, Alicia González, Sheila Gutiérrez (N), Malgorzata Jasinska, Lorena Llamas, Eider Merino, Lourdes Oyarbide, Paula Patiño (N), Gloria Rodríguez y Alba Teruel.